My October Birchbox was a good one! I am hooked on the Shiseido Concentrate and have been using it regularly. My skin is so much softer, clearer, and brighter! Want to see my initial review? Birchbox October Review. Glossybox hit it out of the park with 4 of the 5 items being full-sized! My favorite has to be the tarte Power Pigment - it's amazing! The Proganix Repair has been leaving my hair soft and frizz-free. Want to see each product in better detail? 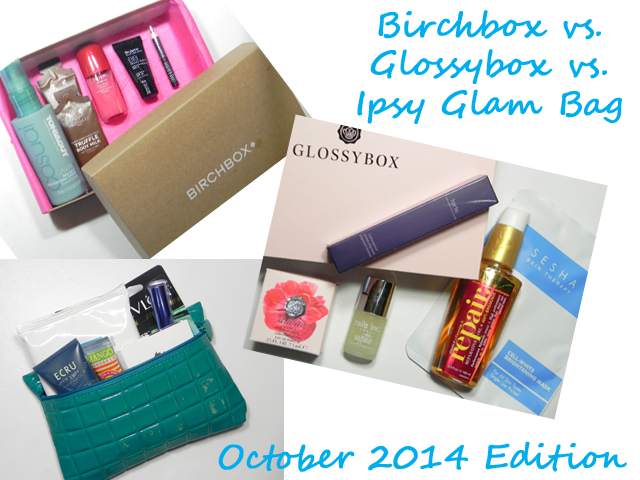 Glossybox October Review. Ipsy's Beauty Candy themed-bag wowed me with the amazing Skyn Iceland Glacial Cleansing Cloths and an extra of my current fave mascara, Revlon Bold Lacquer Length & Volume Mascara. Want to see each product again? Ipsy October Review. All three boxes were awesome this month. All of the products are great and have made their way into my regular rotation. Picking a winner is certainly difficult here, as I could argue each as a winner. With 4 full-sized products, I have to crown Glossybox as my winner. Next is Birchbox, largely due to the amazing Shiseido concentrate. Finally, Ipsy because it was the lowest value, even though I love the cloths and the mascara. So what do you think? What are your thoughts and who would you have picked?